When I think of my essential beauty tools, my mind always casts to my excessive collection of make up brushes and although they have continued to change the way I apply my make up, it's the beauty tools I don't think about that makes the biggest different on a regular basis. From cotton buds to epilators, I have it all covered. Tweezers | The Tweezerman Slant Tweezers have been an essential in my make up bag for many years now due to their exceptional ability to pluck and tame unruly hair. The perfectly angled, easy to grip tweezers grab every hair, every time. Eyebrow plucking aside, tweezers can be used a variety of different ways including applying false eyelashes. If you don't own a good pair of tweezers and you don't want to fork out £20 for a pair, then I would recommend Boots or Superdrug's own. Cotton Buds | Although cotton buds will never be the most glamorous, exciting beauty tool, they are a bathroom cabinet essential. After the obvious ear cleaning, cotton buds can used for cleaning up a manicure, applying spot treatments and my favourite; smudging out eyeliner. They're cheap as chips, easily disposable and can make for a effective way of cleaning up any make up mishaps. Any 100% cotton bud will do, but I always stock up on the Johnson's Baby Cotton Buds as they're soft and gentle on the skin. Epilator | Hair removal in general has always been something that I dread. Waxing, threading, hair removal creams, I've tried them all, but one method that is here to stay is epilating. Although this method hurts and makes me wince even just thinking about it, it works so well at removing hairs and reducing regrowth. If you're a looking into epilating, then I would recommend the Braun Silk- épil 9 Wet & Dry Epilator*. Being able to use it in water makes it less painful, it can be used all over the body and it efficiently removes hair fast. 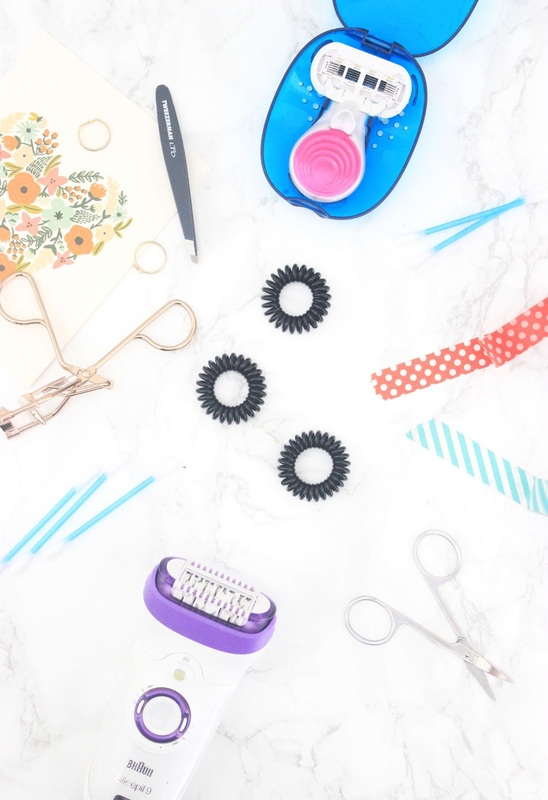 Hair Bands | Up until recently, I had never been hair concious; dying, blow drying and straightening my hair to within an inch of it's life was something that took it's toll on my hair, so I knew that something had to change. Invisibobbles, described as a traceless hair ring help to relieve headaches, tie the hair securely without damage and reduce the risk of breakage. Nail Scissors | Nail scissors are something I receive every year at Christmas either in a cracker or part of a stocking filler manicure set, and although I don't use them to cut my nails, I have found they're probably the most underrated tool that I use. I mostly use them to trim false eyelashes and to cut open any product packaging, boring I know, but very useful. Razor | Although epilating is one of my favourite forms of hair removal, I still can't put away the razor as it's cheap, painless and easy to do on a regular basis. The Gilette Venus Snap Razor* is perfect for prepping your legs quickly and getting into all nooks and crannies of your body. If you're looking for a razor that close shaves, doesn't nip and is easy to control, then the Venus Snap Razor is your best option as the short handle allows for a controlled shave and precision. What are your essential beauty tools?